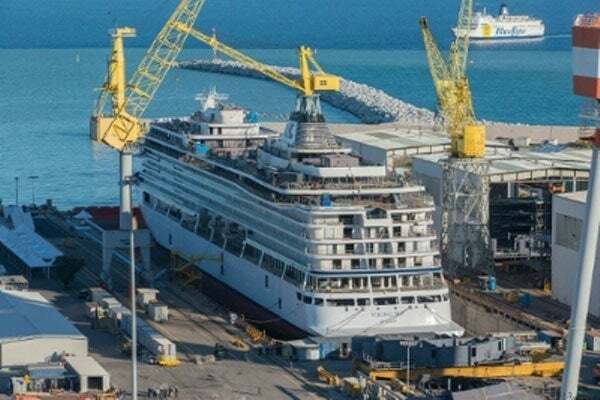 Viking Sea was launched at Fincantieri’s shipyard in Ancona. PRNewsFoto/Viking Cruises. The cruise ship was floated out in June 2015. PRNewsFoto/Viking Cruises. Viking Star, the sister ship of Viking Sea, was launched in March 2015. Viking Sea is the second ship of the Viking Star-class of cruise ships operated by Viking Ocean Cruises. The first ship in the series, Viking Star entered service in March 2015. In June 2015, Viking Sea was launched at Fincantieri’s shipyard in Ancona, Italy. Steel for the project was initially cut at Marghera shipyard in September 2014. The ship was delivered in March 2016. Viking Sea completed its maiden voyage from Istanbul to Venice in April 2016. The ship was christened on London’s Thames River in Greenwich in May 2015. The third ship on order, Viking Sky, is also being constructed at Fincantieri’s shipyard, and will debut in 2017. The ship was launched in March 2016. All three ships will sail through popular routes in Scandinavia, the Baltic, and the Western and Eastern Mediterranean. In November 2015, Viking Ocean Cruises ordered a further two cruise ships from Fincantieri. These ships will be similar to the three Viking ships, and will join the fleet in mid-2018 and at the end of 2020, respectively. Viking Sea weighs approximately 47,800gt, and features 465 staterooms to accommodate 930 guests. It was designed by nautical architects and engineers from London-based SMC Design and Los Angeles-based Rottet Studios. Viking Sea features nine decks with unique level plans. Deck 1 features a spa, a living room, a fitness centre, a bar and a salon. Deck 2 houses a theatre, a bar, two cinemas, shops, an atrium, a multi-cuisine restaurant, and a wraparound promenade. Deck 3 features 97 staterooms, Deck 4 has 123, Deck 5 has 111, and Deck 6 features 99 and a navigational bridge. Decks 1-6 have a self-service launderette. Deck 7 features a pool with a retractable roof, the main level of the Explorer’s Lounge, a garden, an Aquavit terrace with al fresco dining, an infinity pool, and a hot tub. Deck 8 houses 19 staterooms and feature the upper level of the Explorer’s Lounge. The uppermost deck, Deck 9 features an outdoor gym and a yoga area. Below Deck 1, Deck A houses a medical centre. The vessel features a variety of accommodation facilities to suit passenger requirements. It has five stateroom categories, including standard, deluxe, and penthouse verandas, and junior, explorer and penthouse suites. Veranda staterooms have a king-size bed with luxury linens, a large flatscreen LCD TV, luxury toiletries, satellite and cell phone services, a security safe, a hair dryer, Wi-Fi, interactive TV and on-demand movies, and 24h room service. Deluxe and penthouse verandas, and junior and explorer suites offer mini-bars with soft drinks, water and snacks, in-suite binoculars, coffee makers, shoe-shine and pressing facilities, laundry, and cashmere blankets. Priority shore-excursion, restaurant and dining room reservations are available for these rooms. Explorer suites are two-room suites offering ocean views from private verandas. They feature the highest number of amenities of all the onboard stateroom categories. The ship offers multiple dining options. The Restaurant on Deck 2 and the World Cafe on Deck 7 offers a variety of global cuisines and regional specialties. The Mamsen’s on Deck 7 serves Norwegian deli-style fare. The Chef’s Table and the Kitchen Table on Deck 1 offer further dining options. Viking Sea features a three-deck atrium where musicians play regional and classical music. The Theatre on Deck 2 hosts live performances, lectures from scholars and experts, and an onboard cooking school. "Viking Sea weighs approximately 47,800gt, and features 465 staterooms to accommodate 930 guests." The Torshavn piano lounge is located on Deck 2. The cinemas show a mix of recent and classic movies. On Deck 7, the main pool’s retractable dome allows swimming in any season, while a glass-backed infinity pool allows guests to observe their surroundings as they swim. The Wintergarden around the main pool features clean, uncluttered, Scandinavian-design environment. The ship is powered by energy-efficient hybrid engines, hydro-dynamically optimised and streamlined hulls, and bows designed to achieve maximum fuel efficiency. It also incorporates on-board solar panels, and use equipment that minimises exhaust pollution while meeting environmental regulations.